This system has been upgraded to RO-9O, Please click HERE for system details. Unlimited ultra fresh, clean, great tasting water right at home. Best quality water for cooking and making delicious coffee, tea & ice. Save money, time, and hassle of buying costly, heavy bottled water. Live healthier with ultra safe water that is 99% contaminant free. APEC's ULTIMATE RO-45 reverse osmosis system was engineered to the highest standards for exceptional performance, durability and safety. 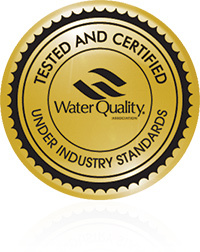 Constructed of select premium components, this system has been tested and certified to the highest standard in the industry- WQA GOLD Seal, to guarantee the highest contaminant removal rates, giving you the purest water possible. We build, inspect and lab test every ULTIMATE RO-45 system in our US facility. This stringent QC process eliminates even the slightest component imperfections to guarantee a system that removes up to 99% of all contaminants and is completely free from water leaks, bursts and noises. For over 17 years, APEC has been an industry leading manufacturer who specializes in high performance RO systems. As the original manufacturer, we have dedicated a knowledgeable and sincere team that is committed to providing customer satisfaction for the entire lifespan of every system. Every APEC system is built to meet the most demanding applications in water purification - from drinking water for homes, to purified water for restaurants, healthcare facilities, and research labs. Our durable RO systems are designed to last for decades and will bring many years of enjoyment and good health for you and your family. Certified to remove up to 99% of all water contaminants to guarantee ultra-safe and clean drinking water for your family. 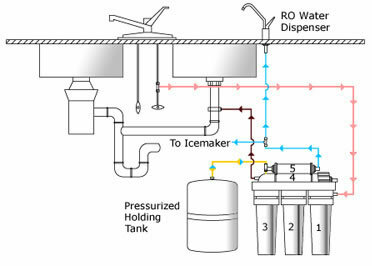 System shuts off automatically when tank is full without wasting any water. Very low maintenance, just change 3 Ultimate pre-filters once a year (every 4,000 gallons). Standard with system: John Guest Quick-Connect fittings; stainless steel check valve; clog-free flow restrictor; 5 feet of food grade tubing & versatile ½” to 3/8” feed water adapters. High quality lead-free faucet & 4 gallon pressurized tank also included.